It feels great to finally have this quilt out of my work in progress pile. I’ve been working on this project on and off for the past year and a half. This is my largest quilt I’ve made so far, measuring in at 80″x80″. I rarely make quilts from traditional block patterns, preferring to stick with a more modern feel with rectangles and simpler designs. However, I really had a desire to get out of my comfort zone and move forward with a more traditional block. I used really fun, happy prints to keep the block lighthearted. 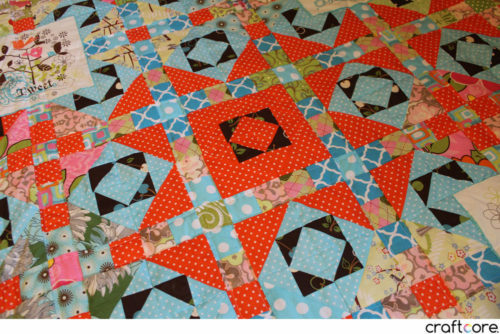 I followed the block pattern from Patchwork Square for Monkey Wrench. I combined 52 monkey wrench blocks with 12 mini panels featuring birds, butterflies, and bird cages. The finished quilt was large so it was difficult to photograph. I was dog sitting for my brother-in-law while photographing this quilt and you can see Sasha peeking out over the quilt through the window. I had a rough idea of what I wanted to do (mini panels starting from the four corners on a diagonal, the orange centre block), but the rest of it was mostly created on the fly on a block-by-block basis. When making each monkey wrench block, I used random squares in the colour palette. 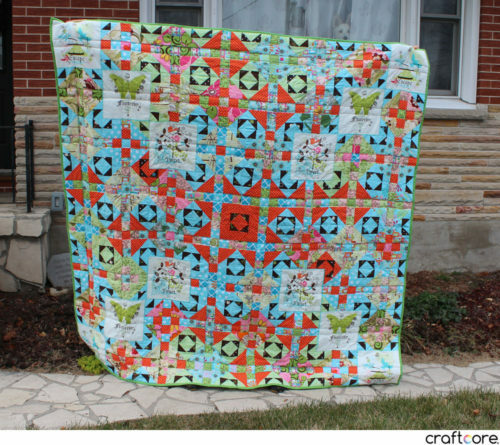 When I first finished my 52 blocks, I actually hated the quilt. I ended up seam ripping at least 10 of those 52 blocks and rearranging them so that I could make a semblance of a pattern. I was a bit happier with the layout once I could make all the corners match in colour to form the on-point mini blocks. The layout is a bit orange heavy in some areas though! 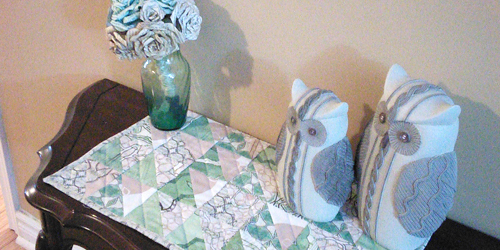 I quilted this project on my Singer 66 vintage sewing machine. This project allowed my Singer 66 to shine. 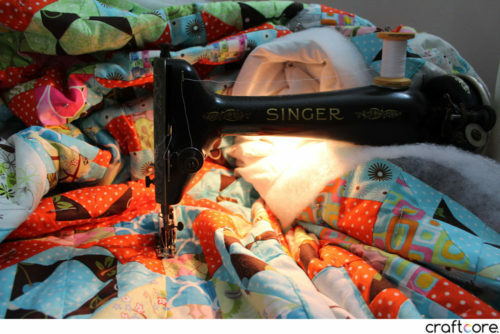 I always hated quilting large projects on my smaller modern machine because the throat space is so small. 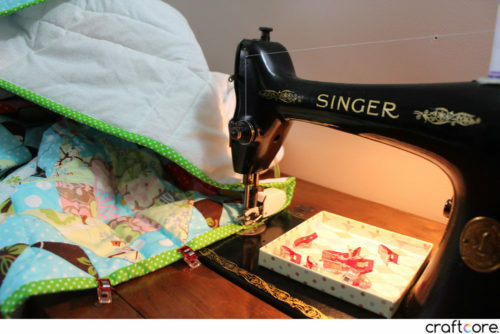 The Singer 66 is no mid-arm machine or anything, but the throat space is much larger than my other sewing machines and I can squish a lot more quilt in there. I’ve quilted a few other projects using the 66 with success, but the large weight of this quilt made it difficult to pull the fabric through. I put my quilting on hold for a few weeks and special ordered a low-shank walking foot attachment for this machine to help evenly feed through the fabric. I can see a big difference in the quality of the stitches with and without the walking foot. 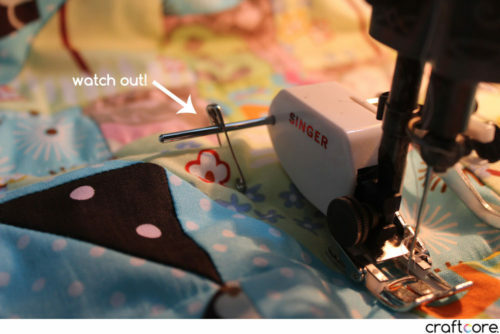 The walking foot helps move the top and bottom layers of your quilt at the same speed. 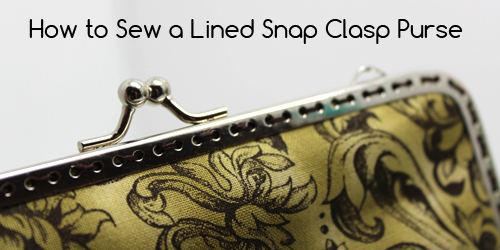 My walking foot has an adjustable seam guide to help evenly space lines of stitching – a great feature! Just watch out that the guide adjustment bar doesn’t get stuck in your basting pins or you could veer off your course. I used a ruler along with my walking foot’s seam guide to help keep my stitching straight in the panels where I wasn’t following along my block’s seams. 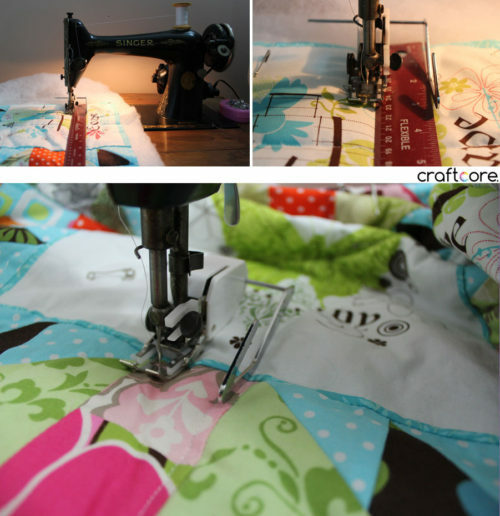 I kept my quilting simple, just following the inner seams of my monkey wrench blocks across the enter quilt in both directions. 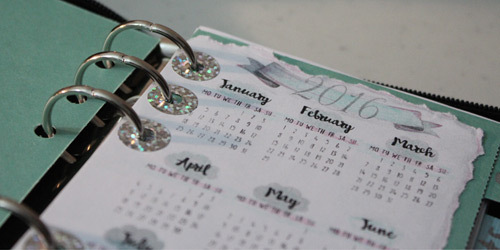 This created a cute square pattern on the back that appear like quilted sashing. The mini panels feature very sweet illustrations. This is a square throw blanket, not specifically designed for a specific bed size. 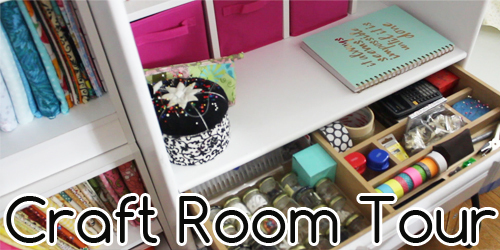 It fits decently on a double bed except that it’s too short. 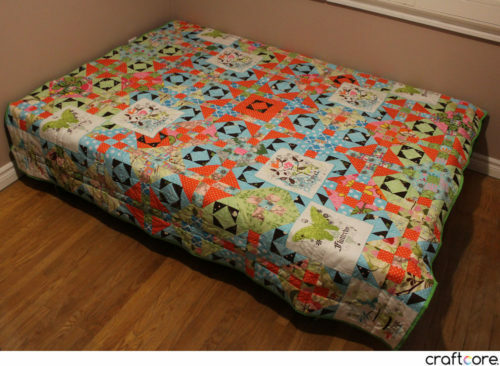 If I were to do this design again, I would want to add another row at least to add some length for versatility in case the recipient wanted to use it on their bed. 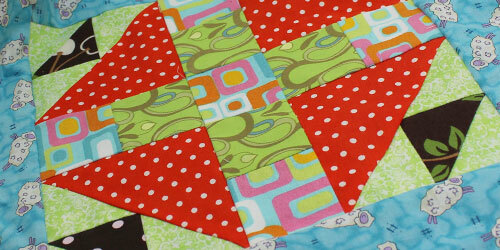 I machine bound the quilt using an adorable green polka dot print. 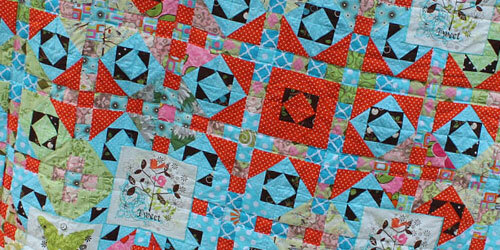 I just adore polka dots, and this colour really tied the prints on the front of the quilt together. A few months ago I scored a great haul at a yard sale, picking up a large amount of white backing fabric, enough for this quilt. This was my first time using wide-width backing fabric instead of piecing together standard width fabric. 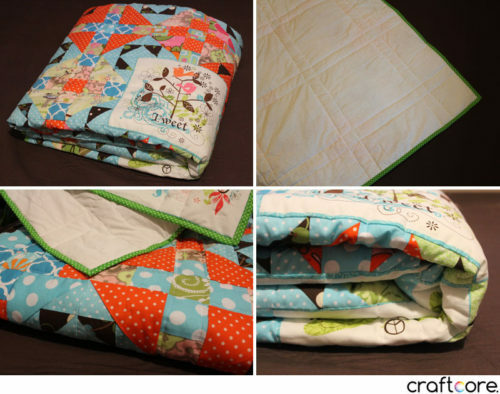 It was absolutely wonderful working with the backing fabric so I will definitely purchase more. 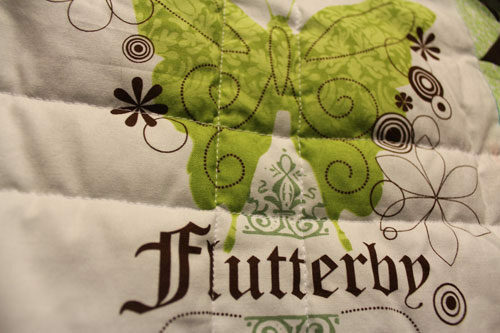 The backing is white with a faint leaf design in off-white. I really enjoyed making the monkey wrench blocks, but if I were to do this again, I would want to make the blocks in the same colour combination instead of making so many different colour variations. This was definitely a huge learning experience for me and I’m glad I saw it through to the end. I can’t imagine the amount of work this took – beautiful!